Civil Aircraft Electrical Power System Safety Assessment: Issues and Practices provides guidelines and methods for conducting a safety assessment process on civil airborne systems and equipment. As civil aircraft electrical systems become more complicated, electrical wiring failures have become a huge concern in industry and government—especially on aging platforms. There have been several accidents (most recently battery problems on the Boeing 777) with some of these having a relationship to wiring and power generation. 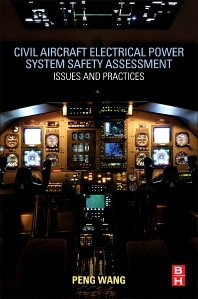 Featuring a case study on the continuous safety assessment process of the civil airborne electrical power system, this book addresses problems, issues and troubleshooting techniques such as single event effects (SEE), the failure effects of electrical wiring interconnection systems (EWIS), formal theories and safety analysis methods in civil aircrafts. Dr. Peng Wang is the deputy director of civil aircraft airworthiness certification technology and management research center of CAAC, Associate professor of civil aviation university of China. Member of C919 Type Certification Board (TCB), ARJ21-700 type certification engineer. Master Degree in Safety Management (ENSICA, France). Seven years experience in system safety analysis, airborne electronic hardware research and certification. Leader of the several aviation safety projects funded by CAAC and MIT (Ministry of Industry and Information Technology of China).